Welcome to Rt.82 Auto Gallery, home of the big city cars with small town prices. This dealership is family owned by two passionate car enthusiasts who enjoy the business and taking care of their clients from start to finish and beyond. We have over 60 combined years in the automotive business and have had numerous years running new car dealerships as a General Manager, Sales Manager and we both have extensive Finance backgrounds. 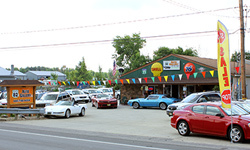 Just enjoy a laid back, no pressure atmosphere where the customers can stop in, browse our inventory, enjoy a cold beverage or a hot cup of coffee, and deal directly with the owner's. Our passion is a comfortable, clean and relaxing dealership, meticulous inventory and being up front and honest with our clients and not having to spend "hours" trying to just purchase a vehicle. We constantly monitor our inventory against every dealership within 500 miles of us to make sure our vehicles our some of the lowest prices anywhere. View our photo gallery and read our reviews. You will see exactly what we are talking about, relaxed, easy going and sincere. Just have fun, enjoy your visit and know that you just purchased a vehicle with no high pressure sales tactics and most importantly no stress. We sincerely look forward to having you join the RT.82 Auto Gallery family! !